If you were expecting some kind of sun sign nonsense, forget about it. This is real astrology for the real world, not some mystical mumbo-jumbo psycho-babble word salad. If it's real astrology for yourself that you want, you can get it by phone or in print. And if you need help deciphering the astrological glyphs in the graphics accompanying this article, see Astroglyphs: Astrological Symbols Guide. Please note: this forecast is expressed in terms of Universal Time (UT, aka GMT). Location for all mundane charts is set for the Great Pyramid at Giza; the choice being strictly arbitrary in any case. Also please be aware that, while I never change a forecast once it's published, I do post errata to acknowledge typographical errors and the like. PLEASE NOTE: This month’s forecast incorporates elements of (and refers to) my complete 2018 World Forecast Highlights (41 8-1/2 x 11" illustrated pages); focused, amplified and elaborated with details for the month as appropriate. The full version of my 2018 World Forecast Highlights is available in hard copy by mail ($75) or as a PDF document by email ($50). Orders may be phoned in toll-free anywhere in North America to 800-527-8761, and charged to any major credit or debit card. Orders may also be placed direct from your own PayPal account page to rnolle@astropro.com – or by using the AstroPro PayPal order page. The celestial configurations of July are huge. For one thing, Neptune spends the whole month within a half degree of its June 18 retrograde station – see my June 18 update for more on this. And then there are the two planetary Max cycles (Mars and Mercury), a Stealth SuperMoon partial solar eclipse, and a total lunar eclipse plus a Jupiter station. They all combine to sketch out cosmic turbulence on a grand scale this month. And it starts right from the outset . . . The June 28 full moon at 6d Capricorn (conjunct Saturn) spills over into July, in terms of geophysical turbulence. With a shock window that stretches from June 25 to July 1, this one signals a significant increase in powerful storms with fierce winds and heavy precipitation, plus moderate to severe seismic events (M5+ quakes and notable volcanic eruptions). Property damage and market panics will be a prominent theme in the news during this full moon, with Earth being in its perigee (close approach) to Saturn at the time. This one fades out early in the month, but it’s just a foreshadowing of much more to come. Falling within just a few days of Jupiter’s direct station at 13° Scorpio, and just a day into the July 12-August 28 Mercury Max cycle, this SuperMoon eclipse opposes Pluto in the sky, while Mars is on the south end of the lunar nodal axis. (More on Mercury Max momentarily; or see pp. 18-24 in the full version of my 2018 World Forecast Highlights for the whole story.) Here’s a note for fellow market watchers: this Stealth SuperMoon eclipse signals a strong potential for significant losses in equities, triggered by energy and financials, with a healthy admixture of geopolitical tensions. All in all, it’s a combination that points to July as potentially the most turbulent geophysical risk period in months. A surge in high tides, powerful storms and moderate-to-severe seismic activity is to be expected as usual – only more so in his case, both because of the eclipse connection, and because the SuperMoon itself occurs less than 24 hours before the Moon reaches its maximum declination north of the celestial equator. In particular, I’m looking at July 6 and 10-15 as the most intense cycle within this period. You should know the drill by now: have your emergency supplies and go bag ready just in case. Remember: the Mercury Max cycle points to a surge in solar storms (X-Ray blasts in the M and X-class), giant coronal holes and Coronal Mass Ejections (CMEs). These solar outbursts dump Gigawatts of extra solar energy onto our home planet, stirring up strong atmospheric and geomagnetic storms (Kp5 and up), and turning up the heat on Earth’s mantle (resulting in increased seismic and volcanic activity). This is therefore far more than regular eclipse action, more even than ordinary SuperMoon action. This is extreme geophysical turbulence – very likely the most extreme of the year as a whole; certainly the most extreme of the year to date. The second major locational cue applies uniquely to solar eclipses: the zone of visibility for the eclipse. In this case, only southernmost Australia and the southern tip of New Zealand’s South Island are in the zone. Stepping back from the global, macro scale of things to the personal end of the spectrum, be sure to check your chart for significant placements around 21° in the cardinal signs: Aries, Cancer, Libra and Capricorn. Anything within a few degrees of these points focuses a lot of attention on you under the aegis of this Stealth SuperMoon eclipse. Take, for example, President Trump, whose natal Venus-Saturn conjunction gets a direct hit from the eclipse – which falls within a few days of his currently planned summit with Russian President Putin. That’s not a promising sign – although the Trump crew will certainly spin it as a win no matter what, as they did with the Korea summit on June 12 – also a Stealth SuperMoon, which just happened to fall on Mr. Trump’s tenth house Sun. 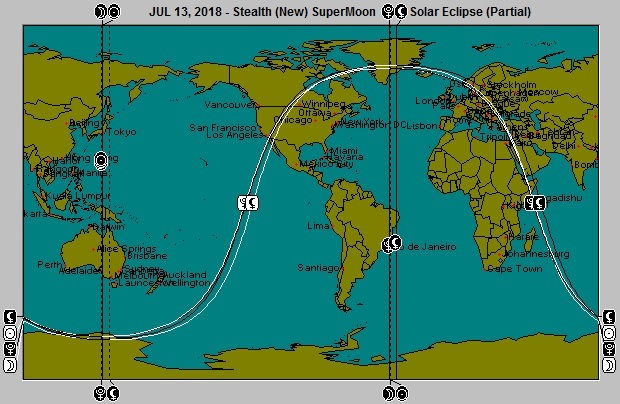 The July 13 Stealth SuperMoon is happening with Neptune still at its retrograde station point in Trump’s seventh house, in T-Square to his natal lunar eclipse. Trump’s grip on truth is always tenuous at best. It’s now at its worst. Believe nothing he says. Trust nothing he does. Whether by misfeasance or malfeasance, everything he does now is perilous. Above all, remember that these celestial alignments are not only signs of newsworthy developments in the world at large; but also of important moments in our own lives. So stay alert and watchful – above and around you, as well as within you. July ends up the same way it began: stormy. It falls under the aegis of a lunar eclipse, after all. So expect the usual, on the macro scale: powerful storms with high winds and heavy precipitation, extreme tidal surges, and moderate-to-severe seismic activity (including M5+ earthquakes and newsworthy volcanic eruptions. The focal point for the total lunar eclipse on July 27 is the Moon’s position at 4°44’ Aquarius – part of a T-Square including the Sun and Moon together with Mars and Uranus. Both Mars Max and Mercury Max figure prominently into this configuration. Mars Max is peaking on the 27th, as the Sun opposes Mars – Earth’s perigee (close approach) to the Red Planet. (More on Mars Max in a moment, or see even more on pages 2-12 in the full version of my 2018 World Forecast Highlights.) At the same time, Mercury is reaching one the five peak points in its Max cycle: the retrograde station on the 26. Here again we have a dynamic, conflicting configuration for the world as a whole; as well as another of this year’s major contacts to the Trump chart – focusing on his natal Pluto. Check your own chart for connections to the area of 5° in the fixed signs (i.e. Taurus, Leo, Scorpio and Aquarius). Contacts point to the lunar eclipse as a likely time of emotional intensity, turbulence and conflict in your life. On the macro scale, the July 24-30 shock window for this eclipse marks off its greatest storm, tide and seismic potential. As always, the scope is planetary; but there are some astro-locality pointers to zones of greater risk. For example, there’s a Sun-Moon-Mars meridian line running down through western Canada and the US Pacific coast in the New World, coming up through Egypt and the Middle East in the Old. Uranus is on the meridian from Japan through Papua New Guinea and Australia, emerging on the other side of the world to cross from the eastern tip of Brazil all the way to Greenland. Pay heed to those horizon lines as well – such as the Uranus crossing over Los Angeles and sweeping through Scandinavia and Eastern Europe, Egypt and the Horn of Africa. As I’ve said for many years now, the biennial Mars Max cycle inevitably signals a peak in tension and conflict on the human level – both individually and collectively. Whether it’s interpersonal or international, this is never a peaceful time. It’s a phenomenon that consistently shows up in the heavens when the tide of human violence surges to extraordinary levels. It loomed large and bright in the sky at the Valentine’s Day Massacre, the start of World War II, the bombing of Pearl Harbor, the start of the Korean War, the Suez Crisis, the 1967 Arab-Israeli War, the 1973 Arab-Israeli War, the Gulf War, 911, etc. Warfare is integral to the astrology of Mars, which is why Roman mythology dubbed Mars the god of war. But war is only one end of the Mars spectrum of violence, which ranges all the way from the individual to the collective, from interpersonal squabbles to mass murder to terrorism to all-out warfare. Consider Columbine a case in point: the archetypal 1999 high school massacre took place within days of the April 24 peak of the 1999 Mars Max. I describe Mars Max in detail on pages 2-12 in the full version of my 2018 World Forecast Highlights, to which I refer the uninitiated. For now, suffice it to say that it’s a term I have given to the phase in the Earth-Mars-Sun relationship when Earth catches up to and then passes Mars in its orbit. The 2018 cycle began on March 24, and concludes on December 3. The peak comes on July 27, when the Sun opposes Mars. That’s when Mars appears biggest and brightest in our sky – and in human experience. Remember Anthony Burgess’ A Clockwork Orange? It was all about ultraviolence – which is also what Mars Max is all about. (Ionically, Burgess’ novel was published in `1962, under a Mars Max.) I’m not saying that all hell breaks loose during a Mars Max. We have survived plenty of them in years past, obviously. The fact that wars, terror attacks and mass murders show up during the Red Planet’s close approach to Earth doesn’t they’ll break out this year. But they already have, and the cycle hasn’t peaked yet. "Fires, crashes, clashes and explosions": that’s the Mars Max mantra in brief. We’ve already seen plenty of these in the months since the current cycle began. They’re about to get worse, most likely. Do all you can to steer clear of trouble this month – particularly around the 27th – because there’s bound to be more of it than usual. Think safety and security, cultivate peace and harmony – but don’t take a knife to a gunfight. The third Mercury Max cycle of 2018 begins this month on the 12th, when the little planet reaches its maximum elongation east of the Sun. It concludes on August 28, when Mercury reaches maximum elongation west of the Sun. in between comes the infamous Mercury retrograde of astrological legend – a kind of Murphy’s Law creep show when everything that can go wrong will, according to the popular press. Not exactly. The truth is that Mercury and Earth are in their close approach (perigee) phase during this cycle, when Mercury on its faster, inner orbit catches up to Earth and then passes us. Like Mars Max – and SuperMoon, for that matter – Mercury’s perigee pass means that it appears bigger and brighter in the sky at this time. So far from being weakened, Mercury is actually more prominent during its Max phase. If all of this is new to you, the astrology you’re familiar with is obsolete by at least a few centuries. Mercury has from time immemorial signified the light in our eyes: intelligence, cleverness, guile and wit. If a more prominent Mercury wrecks all your plans and projects during the retrograde portion of Mercury Max – when the little planet is at its brightest – it’s only because you’re not paying attention or doing your due diligence; or because someone who does have their eye on the ball is eating your lunch. Stay sharp, stay focused, and have a Plan B mapped out in advance! There is a disruptive element associated with Mercury Max – but it applies equally to all; which means that clever awareness and forethought can surmount or at least mitigate it. The disruption stems from solar disturbances that arise from Mercury’s interaction with the Sun’s energy field. This manifests as solar storms including X-Ray bursts (M and X class), coronal holes and Coronal Mass Ejections (CMEs) – all of which combine to dump Gigawatts of extra energy into Earth’s magnetosphere, atmosphere, crust and mantle. You’ll know this is happening when you see upticks in auroral displays and geomagnetic storms (Kp 5 and up). You’ll see it in increased atmospheric turbulence and seismic activity. Who cares? Everyone who depends on electrical systems and networks, from satellite and communication systems to energy grids to travel and commercial infrastructure. Have your backups, fallback positions and backup plans ready. And don’t forget that the human nervous system is a bioelectrical network – which is also subject to solar blasts and geomagnetic storms. Lots of people don’t even notice such things, but many others do. If you’re one of the sensitives, you most likely already know it. In shich case, do whatever helps during Mercury Max. I’m not saying you should hide out in a Faraday cage – but living in a stucco house wouldn’t hurt. While all of the above applies to the Mercury Max cycle as a whole, there are five points within it that stand out as posing greater than average risk. These are the beginning and end of the cycle (the maximum eastern and western solar elongations), the stations (retrograde and direct), and the inferior (nearside) conjunction with the Sun. See the accompanying table for the dates this time around, and bear in mind that the zone of peak sensitivity extends three days either side of these dates. A quick word in passing about the so-called "shadow" and "storm" periods extending before and after Mercury’s retrograde and direct stations. You can forget these. They’re artificial distinctions derived from looking at an ephemeris, instead of at the sky. The maximum east and west solar elongations of Mercury are astronomical realities, not astrological dogma. You’ll find the solar elongations in astronomical software and references because they’re real sky events. You won’t find the "shadow" and “"storm" nomenclature anywhere outside of traditional astrological dogma. Again, see the full version of my 2018 World Forecast Highlights (pp. 18-24) for more on this. All mundane astrological charts as well as eclipse and astro-locality maps are set for the Universal Time (UT) of the event, and calculated and produced using Esoteric Technologies’ Solar Fire Gold Version 7.0.8. Charts are set for the location of the Great Pyramid - a purely arbitrary choice, since location is irrelevant to these charts. Unless sotherwise noted, sky map images are screen captures from the Pocket Universe or Star Rover apps for iPhone, or produced by Starry Night for Windows; storm tracks are screen captures from The Weather Channel app for iPhone; and earthquake maps are screen captures from the QuakeFeed, QuakeWatch or QuakeZone apps for iPhone. Any market images are screen captures from the default iPhone Stocks app, unless otherwise noted. Weather images and storm tracks are screen captures from the Weather Channel app for iPhone.